Although the idea of “walking down the aisle” has all sorts of deep and meaningful connotations – getting married, pledging your commitment and starting a life together – I mean it in the most practical way possible : how are you going to walk down the aisle? And before you think I’ve gone completely crazy and that wedding planning has interfered with my ability to write … here are a few things I’ve realized a bride needs to decide on (some of them not as obvious as I would have thought). Generally the most obvious decision, but there are still a few options available – whether it’s the traditional Wedding March, a classic piece of music you love, or a contemporary song that has special meaning to you, there are still a few choices for such a relatively simple concept. You could guess that I haven’t decided what I will be prancing down the aisle to – have some classical pieces in mind, and also one or two “modern” songs we love as a couple – will have to do a few trial “walks” to decide! When choosing, keep in mind the length of your aisle and length of your song – you don’t want to run out of music while you are still walking past friends and family. Also take note of how your song starts and at what stage of it you’ll reach your fiancé – it will be sad if you miss out on your favourite part of the music because you’ve finished your “walk”. How wide is your aisle? A little bizarre question, but also important – especially if your wedding dress is full of netting, or if you want both parents to walk you down the aisle. 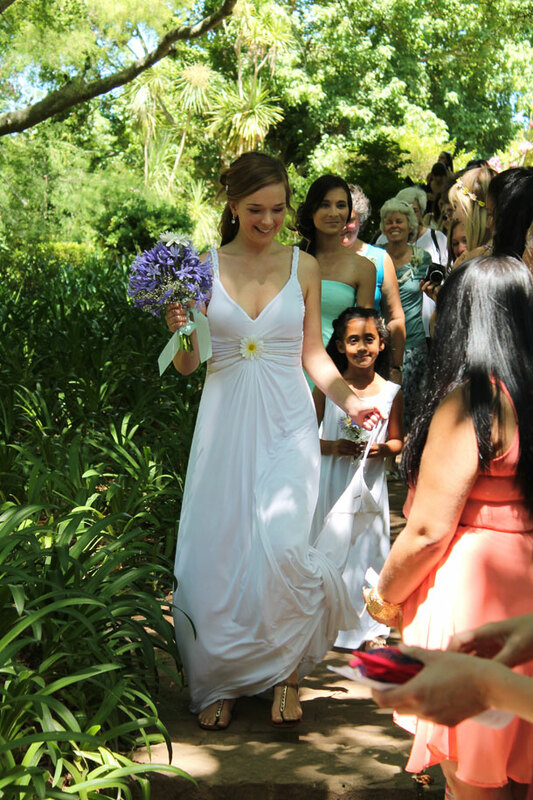 Make sure it’s wide enough for you to comfortably walk next to someone else, with neither of you (or your dress!) getting caught on the side of the aisle.